We've just been seated for what's being billed as the event of CES this year: Qualcomm CDMA Technologies' press conference. Just kidding -- but seriously, though, we're told that HTC, Lenovo, and others will be on hand, so who knows what might end up happening? Read on! 3:47PM And that's a wrap -- we're out! 3:47PM We're intrigued by his reference to an integrated dual-core Snapdragon that includes LTE and 3G modems on the chip designed specifically to drive LTE adoption among smartphones. Now that's what we're talking about! 3:46PM No clear-cut answer so far, but Amon is alluding to the fact that dual-core CPUs can and will make it into smartphones. 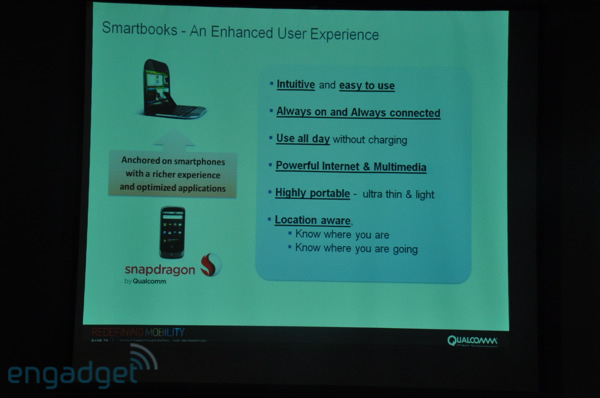 3:45PM A question from us: how are you differentiating between your smartphone and smartbook processors? 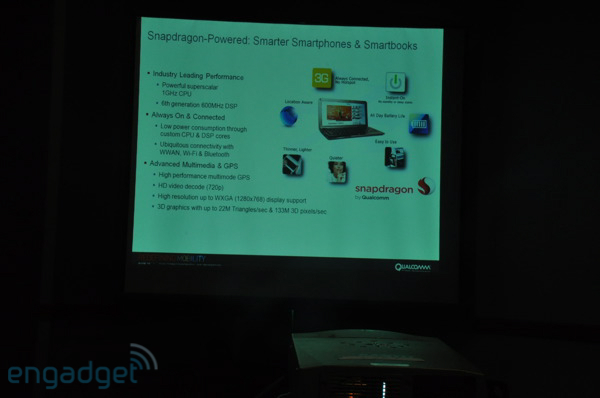 3:41PM Now we've got a question about Snapdragon's roadmap. Turns out Lenovo's Skylight is using a 65nm chip; 45nm versions will be available for sampling this month that go up to 1.3GHz. Later in the year, dual-core chips up to 1.5GHz will get real. 3:39PM Next question: Brew MP has 18,000 apps? Answer: Brew MP is an operating system that's backward compatible with Brew software -- so theoretically, yes. Thing is, it's up to manufacturers and carriers to decide what apps (if any) are actually available to the user. 3:37PM Question about whether the Smart will come to AT&T. Short answer: AT&T's announcement of Brew MP doesn't have anything to do with HTC's announcement of the Smart. 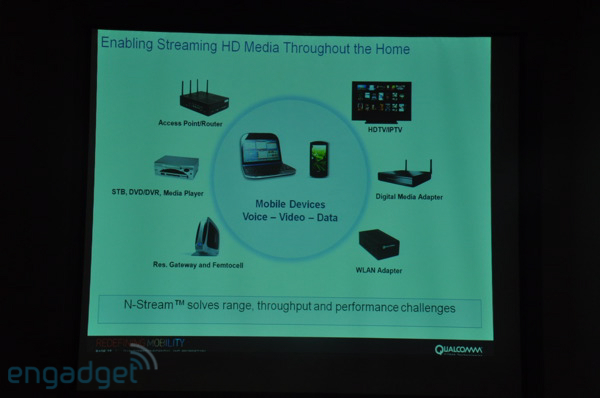 3:35PM The gist of NXP's moment in the spotlight: they're digging N-Stream and using it in a number of their embedded set-top box solutions. 3:34PM Next we've got NXP on stage. 3:33PM He's talking up the Rush, a product we saw earlier in the week. 3:32PM Dan Kelley with D-Link is on the stage. 3:32PM D-Link and NXP are both on-hand to discuss their N-Stream products. 3:31PM One of the big use cases here seems to be beaming fat video streams from room to room in your home. 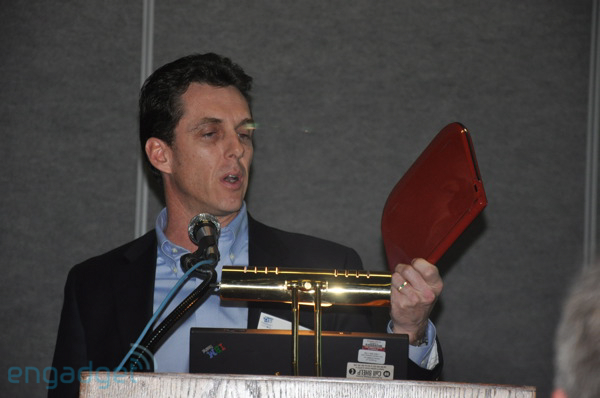 3:30PM He's talking N-Stream 4x4 MIMO wireless LAN tech. 600Mbps peak throughput... juicy. 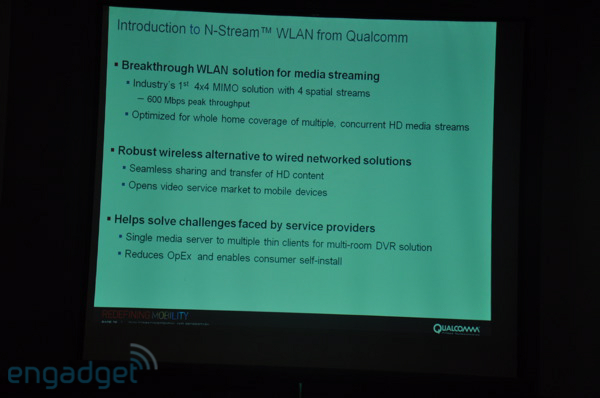 3:29PM Now we've got Mike Concannon, SVP of connectivity and wireless modules for Qualcomm. 3:29PM And off he goes! 3:28PM "We also have a reptutation at Lenovo for creating great keyboards, so we spent a lot of effort on ergonomic design." 3:28PM Here comes the Skylight. Nothing new here! 3:26PM Here comes Peter Gaucher, executive director of mobile internet product management for Lenovo. We suspect we've already seen all of what Gaucher's about to show us. 3:25PM Alas, back to smartbooks. Best of smartphones plus best of netbooks in a single device. 3:24PM Ahh, here we go -- now they're talking about how awesome Snapdragon is in phones. We personally think they've got a lot of room to grow here. 3:23PM Qualcomm's taken the stage back from its partners -- they're talking about Snapdragon and tying it to the slogan "going beyond the smartphone." 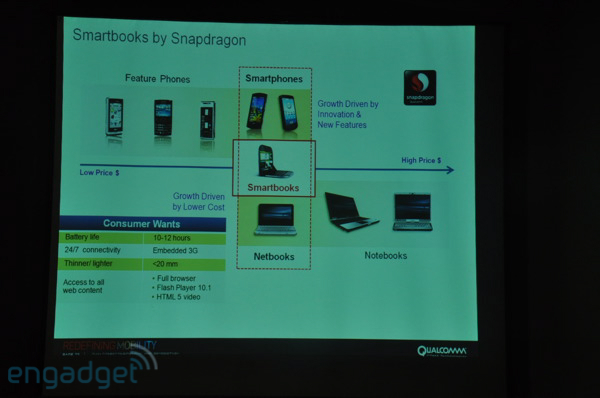 They've been pushing the smartbook concept from day one, so that doesn't come as much of a surprise. 3:22PM She's mentioning that the carrier will have all of its so-called "quick messaging devices" on Brew MP by 2011 -- something we'd heard at the Summit. It's a pretty amazingly fast switchover. 3:21PM And Chou's off the stage. Next up we've got Carlton Hill, VP of marketing for AT&T. 3:20PM He just re-announced the HTC Smart... so nothing new here yet. 3:18PM "Smartphones are still prosumer -- they're too sophisticated for mass market users to use." 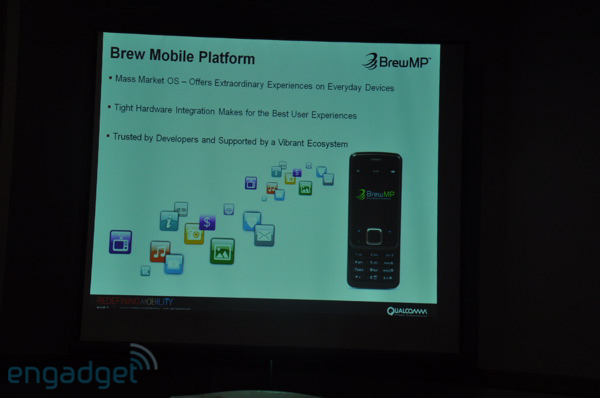 They need an easier, cheaper, simpler phone, and that's where this Brew MP partnership comes into play. 3:16PM "We are still very much focused on the smartphone segment." Good, good! 3:15PM "People all over the world want smarter phones." We see where this is going... we think. 3:14PM HTC's Peter Chou is taking the stage! 3:14PM Brew's got 1200+ handset models, 200M+ devices worldwide (produced, we guess -- not sure how many of those are still in use). 60+ device partners and 18,000 applications. 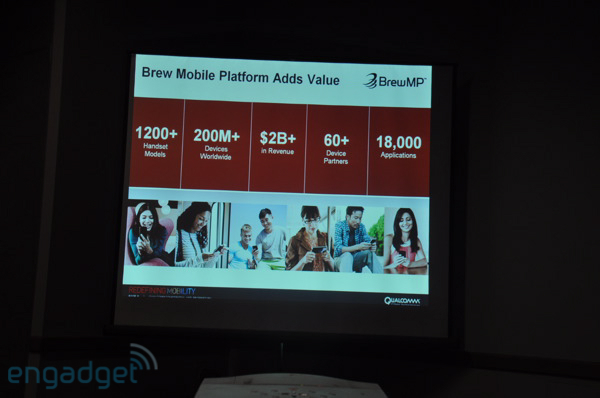 3:13PM Brew MP's sounding interesting -- we know it's what's powering the HTC Smart, and Amon's also alluding to the fact that the platform is all about bringing smartphone-like features downmarket. We can get on board with that. 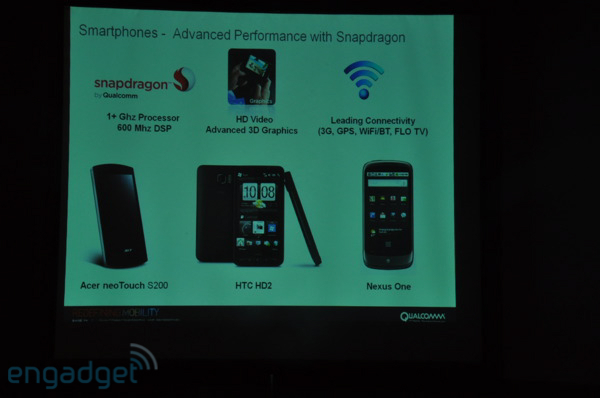 3:11PM Cristiano Amon, SVP of Qualcomm's cellular products group has taken the stage. 3:10PM Brew MP and Snapdragon seem to be big themes here. 3:10PM They're talking about the breadth of devices and types of devices that Qualcomm cores go into -- phones (obviously), e-readers, smartbooks, STBs, and so-on. 3:06PM And here we go! "We're hoping to give you a little more insight into the direction of Qualcomm."